The Intra-gastric Balloon is a non-surgical intervention to assist in weight loss. A soft, round, inflatable balloon made of medical-grade silicon is placed inside the stomach via a gastroscope (camera) that enters through the mouth. Once inserted into the stomach, the empty balloon is filled with sterile saline and can be kept in place for 6-12 months, depending on the type of balloon used. Placement of the intragastric balloon takes approximately 20 minutes and is performed under sedation by a team of qualified gastroenterologists. Because the balloon is inserted and removed in a day clinic and does not involve surgery, it is considered to be a minimally invasive procedure. 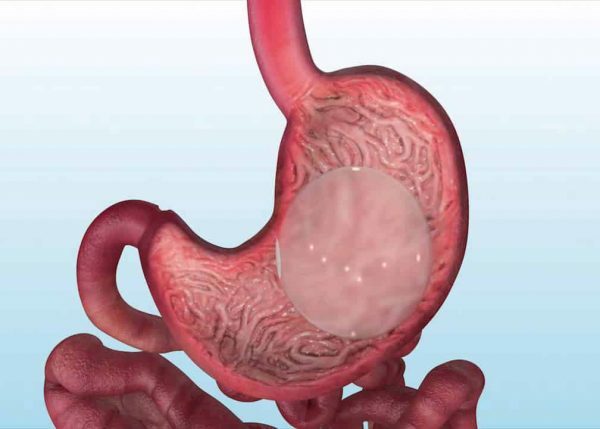 The gastric balloon is also completely reversible, and is removed from the stomach (after 6-12 months in place) in the same way it was placed (via gastroscopy). Gastric balloons are very effective at reducing appetite and improving feelings of fullness (or satiety) after eating. They should be regarded as effective training wheels – they are temporary devices to help kick start your weight loss and institute long lasting dietary and lifestyle change. The intragastric balloon is most effective when combined with a comprehensive lifestyle programme delivered by your doctor and specialist dietitian, behavioural and exercise professionals. The amount of weight loss to be expected is specific to each device; but in general, most gastric balloons will achieve 12-20% TBWL (Total Body Weight Loss) on average; i.e. a 100kg person could expect to lose 12-20 kg. The BMI Clinic team offer the gastric balloon in conjunction with our medically supervised program, incorporating regular, ongoing consultations with our specialist doctors, nurses, dietitians and behavioural psychologists, to ensure maximum results during the balloon placement, and maintenance of weight once the balloon is removed. Which types of balloon are available? The BMI Clinic is the only practice to offer both types of balloon which are currently approved for use in Australia and we have summarised the features of each in the table below.